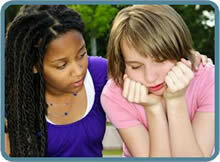 Home » Your Questions: Teens » What if I get kicked out? Sometimes parents react angrily when learning that their child is pregnant. Their anger may be communicated, as “Unless you have an abortion, you must leave your home”. This is an effort to control your decision-making and is a form of coercion. You are now a parent and the decision maker. There is help for you. You could live with a family friend with written permission from your parent(s). Your parents are still legally responsible for you and cannot legally abandon you. Many of these homes are at no cost to you. There are also safe, supportive environments for pregnant women over 18. Women have the opportunity to stay in a home created for pregnant moms. Women can stay for the duration of their pregnancy and can frequently stay after the birth of their child while they transition to independent living. This transition period offers women the opportunity to apply for school, job training, or search for employment. Women can then seek out quality child care. Any Pregnancy Help Center in your area will be able to give you referrals to homes like these. http://www.optionline.org/get-help will help you connect with a local pregnancy help center for referrals. If you are working, or planning on being employed, you could consider getting an apartment and making a home for you and your child. Sharing living expenses with a trusted friend can make living expenses more affordable. There are many referrals for single moms that offer financial support for working moms, as well as educational grants, loans, and scholarships for those choosing to attend school or participate in a job-training program. A pregnancy help center has information for financial support for working moms, education, job-training, etc. http://www.optionline.org/get-help will help you connect with a local pregnancy help center for referrals. Give them time to adjust and to deal with their anger/disappointment. They will be grateful for your independence and determination once they receive the love of their grandchild. Sometimes parents struggle to survive each day. Some parents haven’t had the benefits of good parental modeling themselves. Perhaps they are angry at some of the choices you have made. Perhaps they think they can control your decision making. Perhaps addiction or mental health challenges prevent a parent from being able to express love to their child. Sometimes the fear of not being able to support one more person in the home causes the parent to react vehemently in favor of abortion. A parent can drive their child from the home by creating an environment of chaos, deprivation, and hostility. Parents may fear you will not get an education. Parents may fear you will not pursue a career. College, tech school, and career training are all available to women who parent a child. Child care is readily available on college campuses today. You can leave knowing that you can provide a better life for you and your child. Although you have not felt the unconditional love you deserve, you can provide that love to your child. By contacting a Pregnancy Help Center in your area and asking for a referral for housing for pregnant women, you can start the process of change and growth. You deserve better! There is support available to help you create your own positive living environment. You can take charge of forging a new path and a better life for the family you create.